Highlights of the equipment list on the Style variant are keyless entry, a 6.5-inch colour touch screen infotainment system, leather seats, electric driver seat and bi-xenon headlamps with curve light assistant. Buyers also get eight airbags, multi collision brake, parking sensors with camera and dual-zone climate control. Unique additions to the L&K variant are the three-zone climate control, electric boot lid, boss button (front passenger seat position electrically controlled from rear seat), cooled front seats, fatigue detection and a virtual pedal (contact free access for the boot). 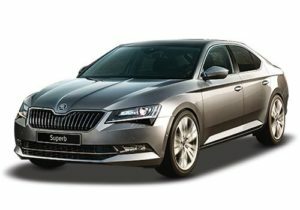 Powering the Skoda Superb are two engine options – 2.0-litre diesel and 1.8 litre petrol. The 2.0-litre TDI produces 177 PS of power at 3600 RPM and 350 Nm of peak torque at 1500-3500 RPM. We only got the 1.8 TSI DSG variant to test at the drive which makes 180 PS of power at 5100 RPM and 250 Nm of torque at 1250-5000 RPM. There is no hint of turbolag in this motor and it goes off the mark quite briskly. As you rev up the motor, the progress gets more stronger. The entire rev range is silky smooth and never does the engine feels strained or overworked. Redlining this engine is a bliss, which comes up around 7000 RPM. It sounds very sporty as you rev higher but no vibrations filter through the cabin. NVH levels are supreme and the cabin is very well insulated.